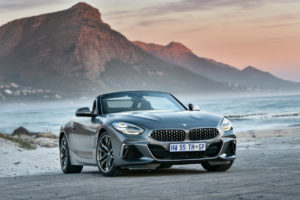 BMW’s Roadster offering has been quiet for some time locally and now with the launch of the new BMW Z4, buyers looking for a stylish, trending Bavarian Roadster are in for a treat. BMWs Roadster offering started in 1989 with the Z1 model (above), a 2 seater model based on “Gusheshe” underpinnings, with dropping door sills for doors and a 2.5-litre straight six engine. 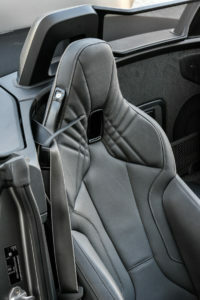 It was produced in limited numbers (8000 units) between ’89 and 1991. In 1995 we had the first mass-produced Z Roadster model, labelled Z3, which made its movie debut in Pierce Brosnan’s Bond film GoldenEye. 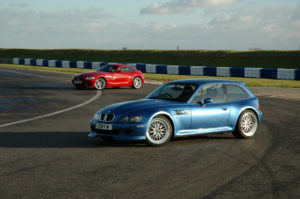 This model also had the manic Z3 M Coupe (above in blue) which included “King of Kwaito” Arthur Mafokate as owners. In 2002 the Z3 designation was dropped for the Z4 model naming with the Roadster and Coupe (above in red) models receiving bigger dimensions. 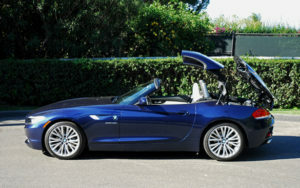 The second generation Z4 (above) was launched in 2009 and it dropped the Coupe model as the Roadster featured a folding metal hardtop. 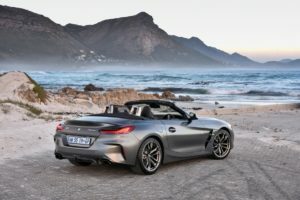 Back to the present and we now have a new Z4 model bowing in Mzansi and it features all the classic BMW Z Roadster DNA in having a long bonnet, wide track, short front and rear overhangs and a low seating position. Dominating the front is new-look mesh-design BMW kidney grille and vertical LED headlight arrangement. Optional Adaptive LED headlights add a matrix function for the non-dazzling high beam and cornering lights. Lower side air intakes on the Z4 M40i model are larger featuring a unique fog light housing whilst the centre air intake is wider and deeper for a more aggressive look. The Z4 2.0i sDrive has smaller side air intake whilst the central air intake has a black front splitter below it for a more subdued look however buyers of the sDrive model can also opt for the M Sport package giving their Z4 a more aggressive look. The bonnet has aggressive contours leading to the kidney grille. The side gets a character line that runs from the bonnet top to the rear lights whilst another line runs from the side Air breathers to the rear wheel arch. 18-inch wheels are standard on the sDrive models whilst the M Sport sDrive gets different design 18-inch wheels. The current range-topper, M40i, gets 19inch M wheels as standard. The Z4 replaces its predecessors folding metal roof for a soft-fabric top which BMW claims offers hard-top like levels of refinement. It is electrically operated and can be opened or closed in ten seconds, even when travelling at up to 50 km/h. Matt silver roll hoops are visible with the top down and besides protection, in case the Z4 rolls, offer a design accent. A wind deflector is placed in between the two seats to aid wind buffeting with the top down. The rear gets slender LED L-shaped lights, a boot lid’s integral spoiler and diffuser in between twin tailpipes. M Performance models get trapezoidal shaped exhaust outlets. 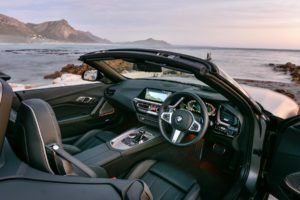 The strict 2 seater interior gets model-specific sports seats with integral head restraints with the BMW Z4 M40i upholstered in leather and Alcantara interior. The Z4 comes with BMWs Live Cockpit Professional that comes with a navigation function in a high-quality display network consisting of a high-resolution 10.25” Control Display that can be operated by touch and a fully digital 10.25” instrument display. The BMW Operating System 7 can also be operated via the iDrive Controller. There is storage space behind the seats, cupholders under the centre armrest cover (which folds open in two sections with a longitudinal split) and large door pockets for practicality. Boot capacity is 281 litres whether the soft-top is open or closed. 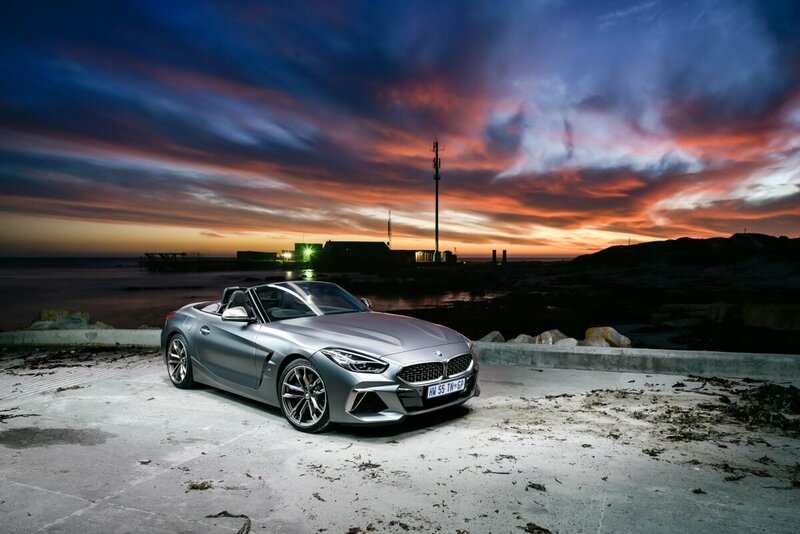 Two engines are currently offered in Mzansi with the entry-level Z4 2.0i sDrive getting a 145kW/320Nm 2.0-litre 4-cylinder TwinPower Turbo engine claimed to consume 6.5l/100km. 0-100km/h takes 6.6 seconds topping at 240km/h. 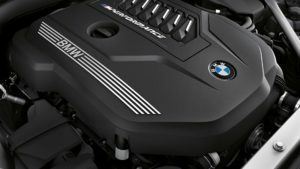 The Z4 M40i uses a 250kW/500Nm 3.0-litre straight six TwinPower Turbo engine to propel the roadster from 0-100km/h in 4.6 seconds on to a limited top speed of 250km/h. Fuel efficiency on this model is claimed at 7.4l/100km. All models drive the rear wheels via a standard eight-speed Steptronic Sport transmission with shift paddles on the steering wheel. Pops and crackles are “standard” on both models as during the launch drive the 2.0 sDrive gave that Vvrrr Phhaaa sound on upshifts with pops on downshifts but the king of that hooliganism is definitely the M40i as the 3.0-litre six engine (below) gives more exhaust delight. The Adaptive M Sport suspension, M Sport brakes and electronically controlled M Sport differential (standard on BMW Z4 M40i) elevate the car’s sporty handling abilities to even greater heights. With these chassis systems on board, selecting COMFORT, SPORT or SPORT+ mode with the Driving Experience Control switch, changes the car’s responses particularly clearly. Like all BMWs sold in Mzansi, the BMW Z4 line up comes with a 5 year/100 000km maintenance plan with a 365 day, 24 hours a day BMW On Call cover.